My name is Anna Conner but I paint under DOMENECH. Anna Conner named a Featured Artist to Watch in Berlin’s Kaltblut magazine 2014, is a artist based in Seattle, WA since 2006. Her work has been commissioned and presented by Velocity Dance Center, On the Boards, Conduit, Chop Shop, Pacific Dance Makers and Movement Research at Judson Church among others. Conner has received residencies from Ponderosa dance (GER) and Velocity Dance Center (WA). 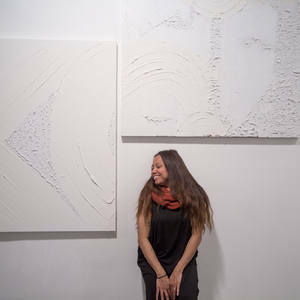 Her work is supported by Foundation for Contemporary Arts Emergency Grants, The Seattle Office of Arts and Culture, and 4Culture. Anna is a managing partner of Open Flight Studio in Seattle. I am inspired by the claustrophobic yet wide, beautiful and painful world we live in.